Re-imagining of prescient internet lecture. It’s been called the "mother of all demos." 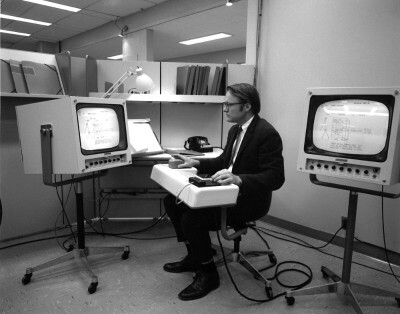 In the fall of 1968, computer scientist Douglas Englebart demonstrated the first computer mouse, the first video conferencing, the first use of hypertext and other advanced features before a conference of computer scientists gathered in San Francisco. 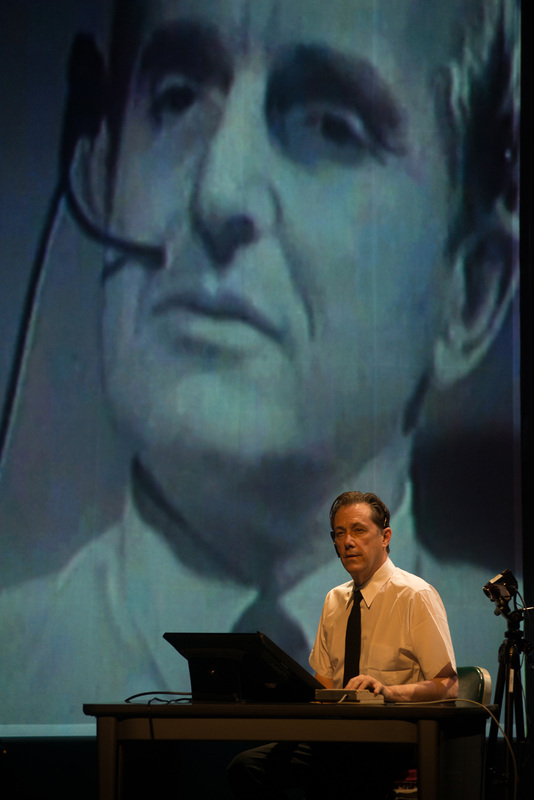 Now Englebart’s way-before-Powerpoint-presentation is the subject of a multimedia musical, The Demo, getting a world premiere at Stanford’s Bing Concert Hall Wednesday and Thursday. Composers Mikel Rouse and Ben Neill built their piece around video samples from Englebart's original presentation, scoring Englebart's words for keyboards, electronic samples, a special trumpet, chorus and video screen. The chorus (made up of local singers) comes in to echo Englebart's own voice as he shows, via video of the 1968 presentation, an early form of word processing. "And so he just starts typing the word 'word,’" Rouse said. "'Word, word, word, word, word.’ So that the singers, as they come in, sing 'Word, word, word, word.’"
In his description, Rouse's voice goes up the scale to give a sense of how musical the word "word" can be. That’s right, a song about the invention of word processing. The subject isn’t much of a stretch for Rouse and Neill, who’ve known each other for 25 years. Both do avant-garde music and performance pieces, sometimes associated with the Downtown scene in New York City. Rouse plays Englebart in the show, as well as keyboards and computer samples. Neill plays his "mutantrumpet," a device of his own invention with two bells and a trumpet slide. But to understand why The Demo matters, it helps to know more about Englebart’s work. The computer science pioneer died in 2013. Bill English worked as Englebart’s chief engineer. “It changed the world in the way computers were used,” English said recently, sitting with his wife Roberta, Englebart’s former secretary, at the Sausalito Yacht Club. “He was thinking of how computers really might -- on a more intimate scale -- support people in what they wanted to do,” English said. They all worked at SRI, the Stanford Research Institute in Menlo Park, as part of a group Englebart founded called the Augmentation Research Center. Its goal: developing ways to help people collaborate via computer, so as to raise human intelligence. That didn’t work out as well as Englebart hoped. But at SRI, Englebart invented and patented the first computer mouse, and English built it. It’s hard to remember now how radical Englebart’s ideas were at the time. It wasn’t until 1984, 16 years later, that Apple’s first Macintosh tapped the mouse for widespread use. But in 1968, Englebart got the chance to demonstrate his ideas to a wider audience when he was asked to present a paper on his work at the Fall Joint Computer Conference held in Brooks Hall in San Francisco. Exactly how to do that was the question, when Englebart had to be at one of the custom-built workstations in Menlo Park hooked up to one the team’s huge Control Data Corporation mainframes. And so English, working with Pacific Bell, figured out how to beam live video coverage of the demo to the conference via microwave trucks parked up on Skyline Boulevard, on the Peninsula. 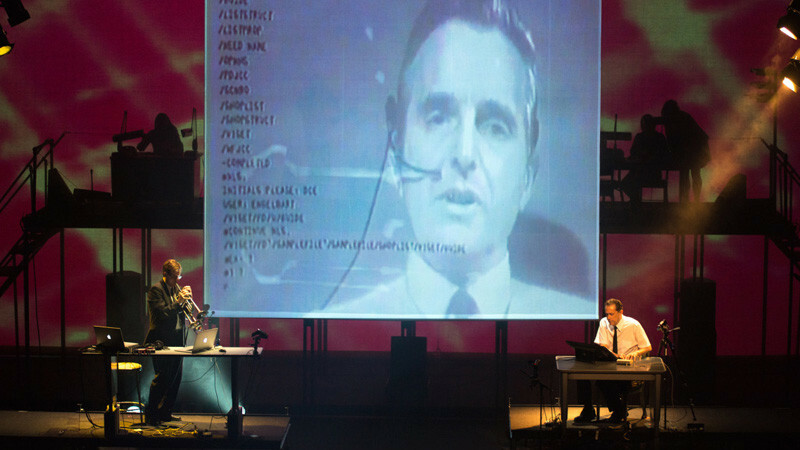 During the 90-minute demonstration, Englebart essentially modeled the way we use computers today. He showed how, with the right interface, a computer could be a personal tool for creating something as mundane as a shopping list, linked to a map. That was a revolution of user friendliness at the time. It’s that human touch that Mikel Rouse and Ben Neill are hoping to honor. Englebart had also hoped that the techniques he pioneered for computer collaboration would help end war and disease. That hasn't happened -- not yet, at least -- but with The Demo, Rouse wants the audience to think about the unexpected consequences of Englebart’s work. “How do you feel about the NSA spying on you?” Rouse said. “How do you feel about Facebook? How do you feel about Englebart’s idea that we bring more people together, [while] in fact, for a lot of people this technology has left them even lonelier?" When Englebart did his demo, he was "dealing lightning with both hands," according to one young computer designer in the crowd. He did it with a keypad in one hand, a mouse in the other. Mikel Rouse and Ben Neill can only hope their musical's premiere is as well-received as Englebart’s original.